Looking for a Used Armada in your area? CarGurus has 9,480 nationwide Armada listings starting at $1,950. The mothership has landed. Nissan's Armada, its top-of-the-line SUV, is essentially a carryover from last year’s model, albeit with a couple of new standard features. There are 3 trim levels—basic SV, SL and Platinum—each of which is available with rear-wheel drive or 4WD. All come with a powerful 5.6-liter V8 engine with 317 hp and 385 lb-ft of torque and a towing capacity of up to 9,000 pounds for the Platinum; that’s the good news. The bad news is gas mileage: The EPA estimates 13 mpg city/19 highway for rear-wheel drive versions and 12/18 for 4WDs. All trims come standard with a 5-speed automatic transmission. The SV level includes such features as a 4-wheel independent suspension, roof rack, vehicle information system with 8-inch touchscreen and 18-inch aluminum-alloy wheels. The SLs add a Bose stereo system, Bluetooth, 20-inch wheels, fog lights and a chrome grille; new for the trim level this year are a power liftgate and heated front seats. The Platinum dials it all in, adding a navigation system, moonroof and 20-inch chrome-clad wheels; new this year are heated second-row seats. All versions are designed to hold 8 adults in 3 rows. Outside, the Armada is very SUV-like, although Nissan has added a dip in the roofline to give it a bit more aesthetic appeal. Color-wise, Nissan sticks mostly to grays and blacks, with the exception of the fire-y red they call Tuscan Sun. Inside the Armada is very clean, and the dash doesn’t look too busy. There have been complaints, however, about the comfort of its interior and the use of too much plastic. The captain’s chair seats in the first row are comfortable enough (a second row is an option), but the rear seats are tight and uncomfortable. 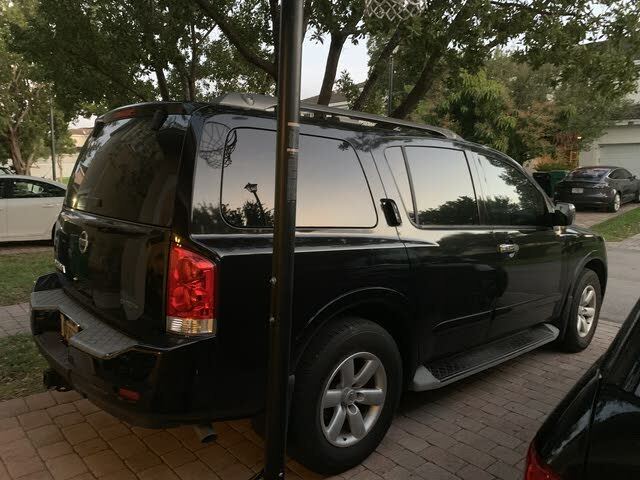 Nissan claims the Armada can seat up to 8 passengers, but that comes with a caveat: if those 8 can hoist themselves up and squeeze into the third row. The car can hold 97 cubic feet of cargo—that’s good, but less than many of its competitors. However, it does have a leg up in that you can fold up the third row instead of having to remove it like other manufacturer’s models. A powered third-row option is available for SV and Platinum levels. Once everyone’s inside, they are in for a reasonably smooth ride. The V8 has plenty of pickup—0 to 60 is estimated at 7.8 seconds, not too shabby for a 3-ton vehicle. The Armada handles all terrain smoothly, but can be a little stiff on pavement. You will feel its heaviness and lack of maneuverability when you try and park. Safety features include front seat side-impact and full cabin-length curtain airbags, antilock disc brakes, and traction and stability control. A rear-view camera is available for the SV level and standard for the others. 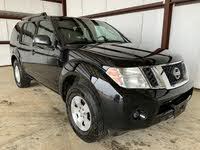 What's your take on the 2012 Nissan Armada? Have you driven a 2012 Nissan Armada? No hot air coming out, I trouble shot the heater control valve and that was good. Any ideas what else could be?